Sometimes you just look into your fridge, shake your head, and close the door again. If you're like me, queen of often not planning in advance, this happens often. Too often in my case. I sometimes find when I get busy, odds and ends of things start to build up in my produce drawer. Finally, when it comes time where I must make something, I'm completely flummoxed over where to even start. Luckily, I find that if you have bacon, you have the world at your fingertips. A little bacon, a little vegetable, and a little pasta, or maybe an egg and you're set. I had bacon, I had radishes, and I had a voice in my head saying, "If you never liked radishes, you haven't had them simply cooked in butter, salt, and pepper." OK, so it wasn't a voice. It was the writing of my friend Jane over at Food and Fiction. She, as usual with topics of the culinary variety, was right. I do like radishes in any form, but cook them in that butter and they transform. A couple of quick housekeeping notes before this lovely recipe (that I'm envisioning making again once the temperature dips below 90 in the house and I want to turn my stove on once more) - You'll notice below I've started to include a printable recipe. Simply click on the link below the name there and you'll be transported (Harry Potter style, yes, I'm a dork) to a printable copy of the recipe. Over time, I'll try to create such links for all of my recipes if you'd like to go back and print them out. I also realize I've been slacking on my commitment to bring you "The Lighter Side of Local" each Sunday or Monday. Life, as I know all of you understand, can be hectic. I promise it will return with a vengeance this week. This is a simple weeknight recipe that is addictive. Read through the entire recipe to start, because for a quick meal, you have to multitask here. The final result, while easy to get to, is impressive. In a large skillet, start cooking up your bacon. You want this bacon cooked until it's crispy enough to crumble, so it holds up in the pasta. Once it is that crispy, transfer to a paper towel-lined plate, and set aside. Now, while the bacon and the pasta are cooking (I like to multitask) take a large, deep skillet or saute pan, and melt two tablespoons of your butter in it. Add your sliced radishes to the pan, spreading them out so they touch the butter, and cooking surface. Once the radishes begin to get a touch translucent, sprinkle them with salt and pepper, and your red pepper flakes. Continue cooking them, until tender. (this takes about 8-10 minutes or so). 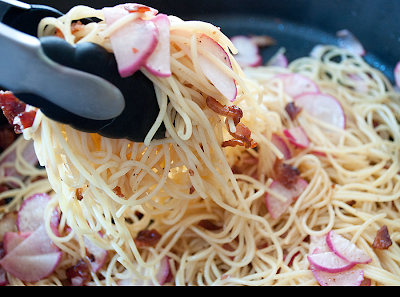 Finally, crumble your bacon over the radishes and stir to combine. Allow to cook about 2 minutes together, and add your pasta to the deep skillet. Toss everything until well-mixed. Add your final tablespoon of butter and toss with the pasta mixture. Cook together for 2-3 minutes and then serve immediately with lots of freshly-grated Parmesan cheese. i NEED TO EAT MORE RADISHES. I THINK YOU HAVE INSPIRED ME TO DO SO! So, does cooking the radishes get rid of a little of the bite? I'm guessing it mellows them out a little bit . . . or, hoping that it mellows them out a little bit. 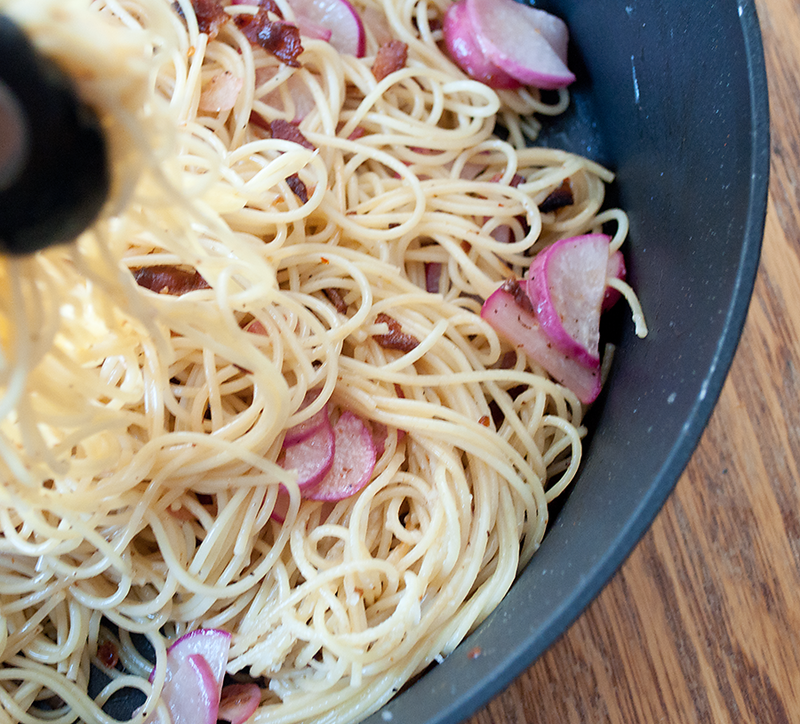 I've never been a big fan of radishes, but combine it with butter, pasta and pig and I just may have to try it! I am so curious about this recipe! I've never had radishes in pasta before! Must try this out! Ooo I love this recipe!! Love the addition of the radishes, yummy! 'If you have bacon, you have the world at your fingertips' lol! I love it! You of course can use it. It's so simple, and turns out so yummy. I'm going to remake it this week I think! This is simply flavored with garlic. This was my grandmother's recipe and I'm just happy to find one. She always suggests to me that I can also mix radish with this and she's right! Yum! Anything with bacon takes it up a few notches of deliciousness! :) YAY! I've always had trouble liking radishes in salads, but it sounds great with bacon and spaghetti!